Paul Gilbert began his career with the legendary shred-metal band RACER X in 1986. Since then, his guitar playing has brought him number one hits with the band MR. BIG, and a devoted following of guitar and music lovers all over the world. Paul's recent foray into instrumental guitar music brought him even more attention, and has resulted in extensive touring with Joe Satriani's "G3" tour in North America and over 100 shows as a headliner in Europe, Japan, and South America. Paul could easily rest on his "Guitar Hero" reputation, but being raised on The Beatles, The Who, Led Zeppelin, and Van Halen always makes him crave some great rock singing and songs. Enter singer and guitarist Freddie Nelson. Freddie and Paul share many musical and cultural roots. Both Paul and Freddie grew up outside of Pittsburgh, Pennsylvania. Both were born the same year and started playing guitar around the same time. Both played in Pittsburgh bands, and even shared some of the same band members. But Paul moved to Los Angeles, and Freddie stayed in Pittsburgh, so they never met. Until now! 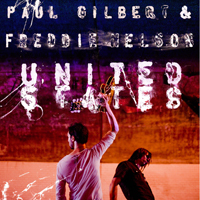 "United States" is the first collaboration of Paul Gilbert and Freddie Nelson. The album features 10 new songs which they wrote, performed, and produced together in the summer of 2008.On first listen, Freddie's name and stunning vocals reminds many listeners of the legendary Freddie Mercury. But listen again, and you will be introduced to a singer, performer, and writer with a unique sound and character all his own. The music on "United States" ranges from arena-rock anthems, to 70's glam groovers, to lush vocal pop gems, to heavy power pop. All with plenty of plenty of Paul Gilbert guitar solos and Freddie's soaring vocals. Guitar fanatics still have plenty of pyrotechnics to enjoy, but mostly this is a melodious, grooving, listenable album for ALL rock fans. Paul and Freddie have just completed a successful, headlining tour of Japan. Keep checking their websites for news of more shows around the world and in the United States!